Emily Nash from Hello! tweeted a video of the Duchess arriving. The garden opened in 2007 and is cared for by volunteers. The garden, which is hidden off a busy London street, has been described as a ‘secret oasis’ by local residents. A secluded community garden with enclosed pond, wildlife woodland, bee observation hive, food growing space, clay pizza oven and spacious classroom facilities. Sessions available in science, bees, food growing, maths, literacy, drama and The Acorn Club. Kate spoke with volunteers and residents about the garden’s role in the neighborhood and its many benefits. It has plots that residents cultivate using organic gardening practices that are said to “promote a diversity of plants and wildlife,” according to the KHWG website. Students from St. Jude & St. Paul’s primary school were at the garden for some outdoor learning. They worked on making birdhouses. 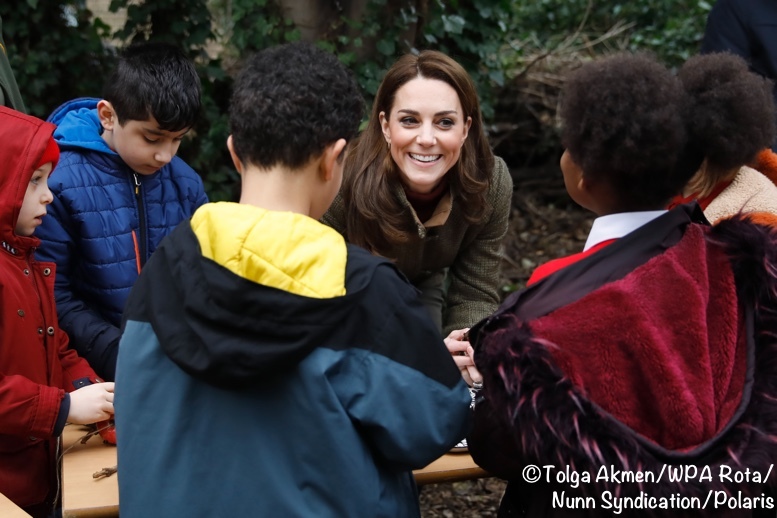 The Duchess asked the children about outdoor creatures, like worms. The garden has an outdoor pizza oven and the children set to work making lunch. 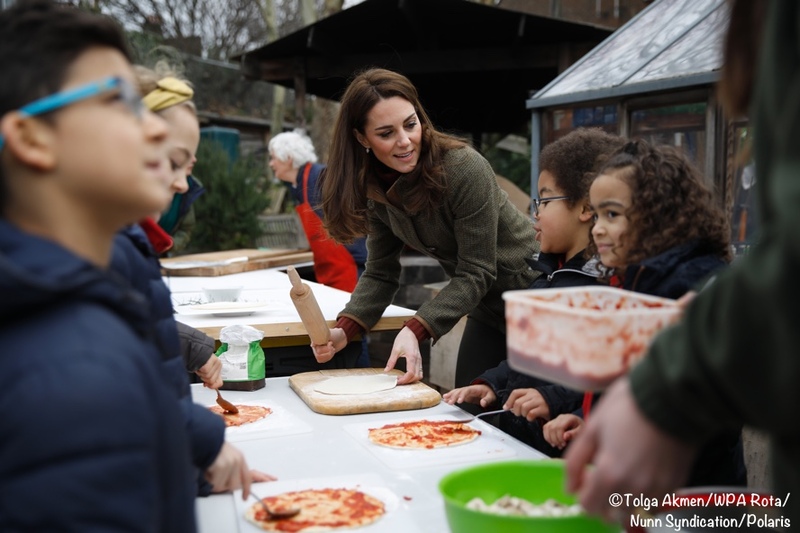 Kate was asked an interesting question: does HM eat pizza? But that wasn’t the only question. ‘What school do they go to?’ Another child asked. 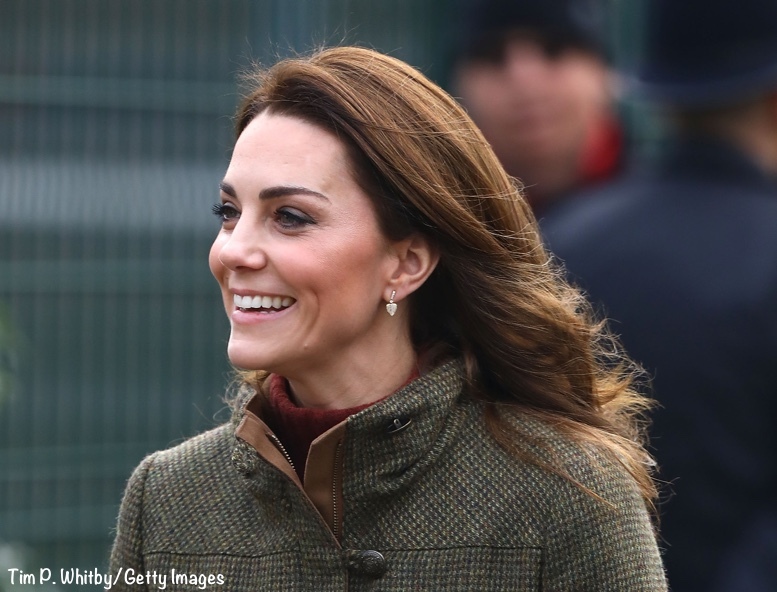 The Duchess spoke about the joys of learning outside of a formal classroom setting. A video of the Duchess receiving gifts from the children as she prepares to leave. She was given a jar of honey by 8-year-old Ayaan Ahmed. 7-year-old Kyrah Symister gave Kate a copy of ‘The Lost Words’ by Robert Macfarlane, with illustrations by Jackie Morris. The book covers words that disappeared from the Oxford Junior Dictionary. 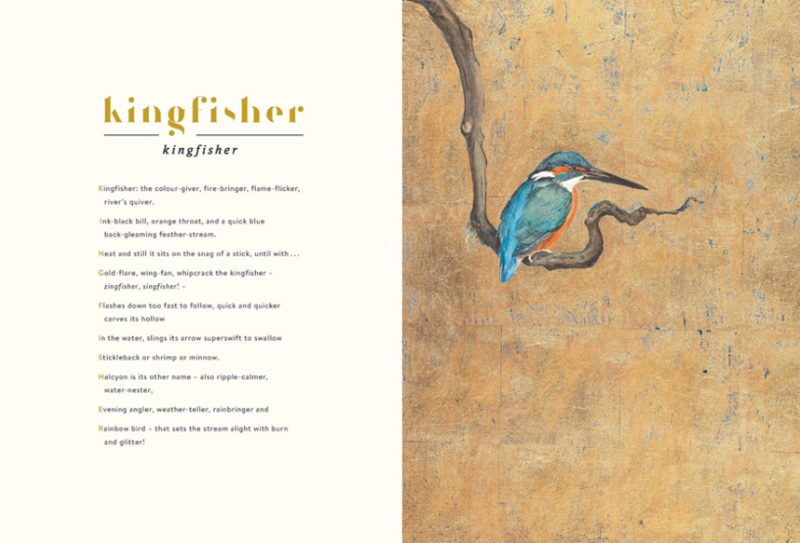 …in a book of spells rather than poems, exquisitely illustrated by Morris, Macfarlane gently, firmly and meticulously restores the missing words. Acorn, blackberry, bluebell, conker and “perhaps the one that cut the deepest” for Morris, “kingfisher”, are lovingly returned to future generations of children. It looks like a terrific concept and even better book. It is available online and at bookstores. Now to the news that the Duchess is working on a garden display for the Chelsea Flower Show. Below, HRH at the 2017 Chelsea Flower Show. Kate at the 2016 show with William and Harry. 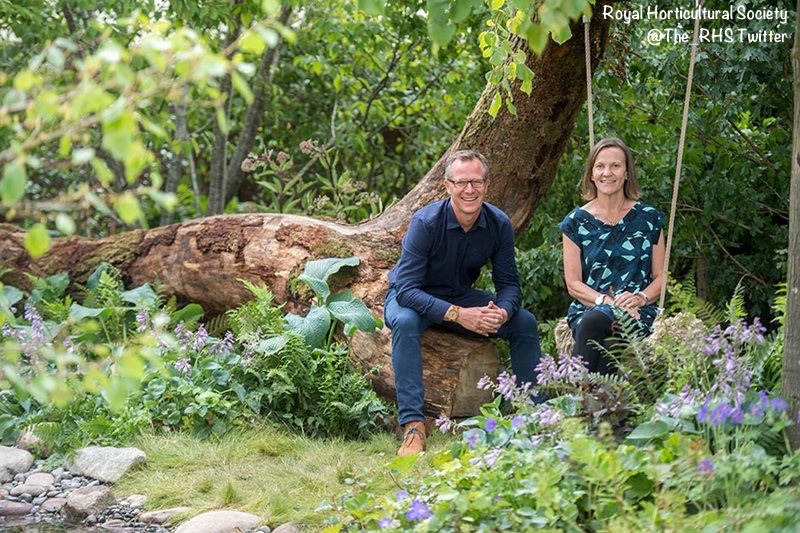 Kate’s creation – a collaboration with award-winning landscape architects Andree Davies and Adam White – will use wild planting and natural materials aimed at providing visitors with a “sense of wonder and magic”. The Duchess has been working on the project secretly for three months, meaning it was one of her first jobs as she returned from maternity leave in October. Below, Adam White and Andree Davis. The RHS notes that the Back to Nature Garden is part of its partnership with NHS England, “promoting the physical and emotional wellbeing that access to green spaces and gardening provides. 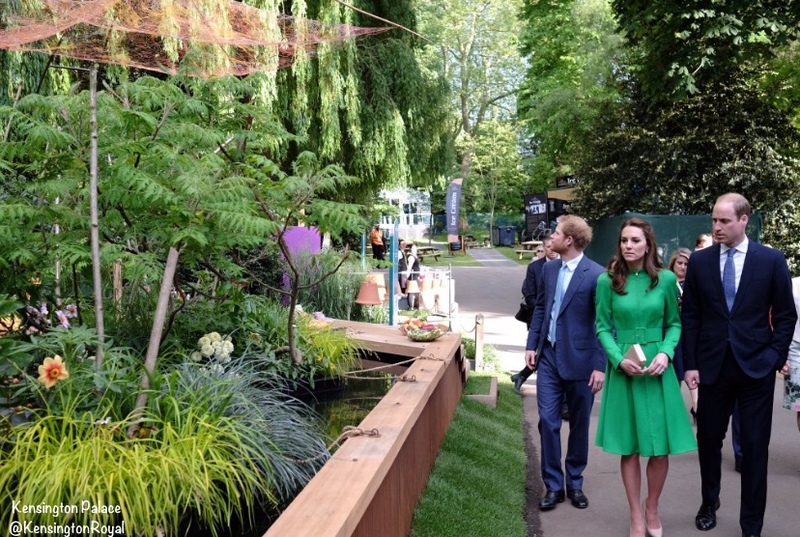 After Chelsea, some of the planting and landscaping will go to an NHS Mental Health Trust, as part of a national competition run by the RHS.” This dovetails perfectly with Kate’s interest in mental health. 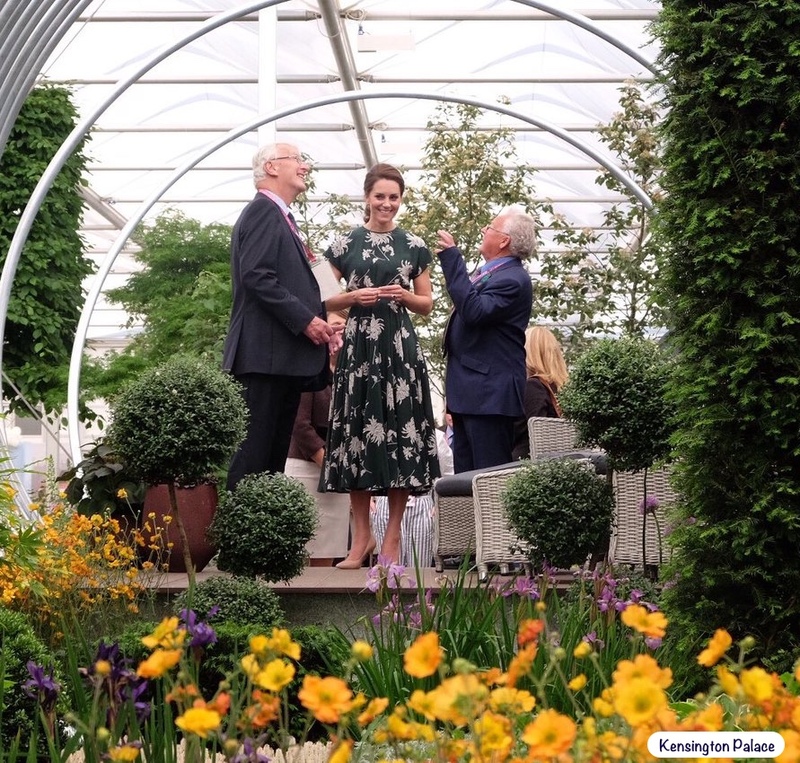 The Duchess will also co-design two further RHS Gardens with the same team, maintaining many of elements from the garden at Chelsea, for the RHS Hampton Court Palace Garden Festival in July and the RHS Garden Wisley in Surrey in the autumn. This year’s RHS Chelsea Flower Show runs from May 21 – 25. 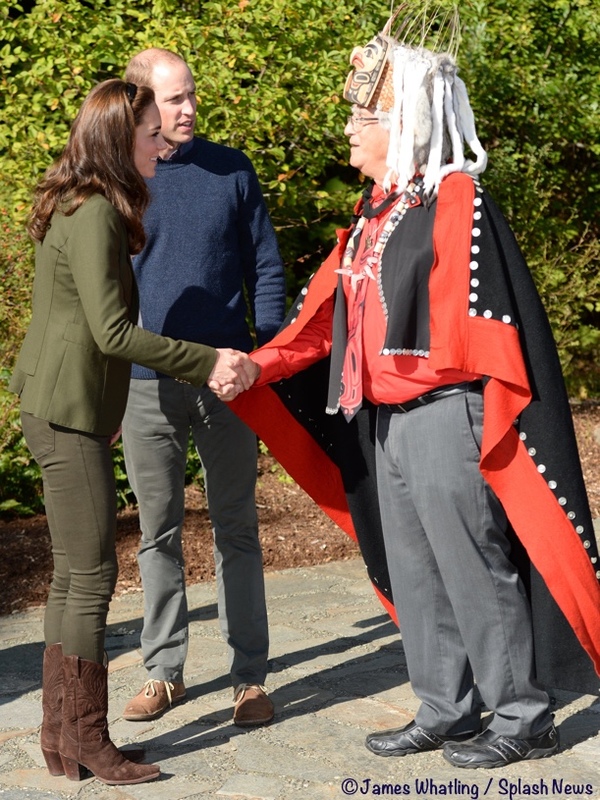 Let’s take a look at what Kate wore for today’s garden event. She was in the Bracken Tweed jacket by Dubarry. The piece is made of Teflon-coated wool and features a standup collar, gathered patch pockets, zippers at the back cuff, and the front button and loop closure. We show it at Outdoor and Country Retail, where it is only available in larger sizes (£279.30, about $360 at today’s exchange rates). At the Dubarry US site, it is available in all sizes ($599). The pictures seen above are somewhat darker than the fabric really is in my mind; I opted for those images because I wanted to be able to show the back of the piece. Below you see the jacket in a truer light. If unfamiliar with the brand, Dubarry of Ireland offers a range of higher-end clothing, boots and accessories. The majority of products are what I call ‘upscale utility wear,’ pieces that provide protection from the elements that are also attractive, designs that work well for both town and country settings. The brand’s tweeds are woven in Scotland, while much of the actual production is now done in Portugal. The company was named after Madame du Barry, the renowned French courtesan. The Duchess had on what appeared to be a new turtleneck sweater. A closer look at the rollneck and cuff detail. 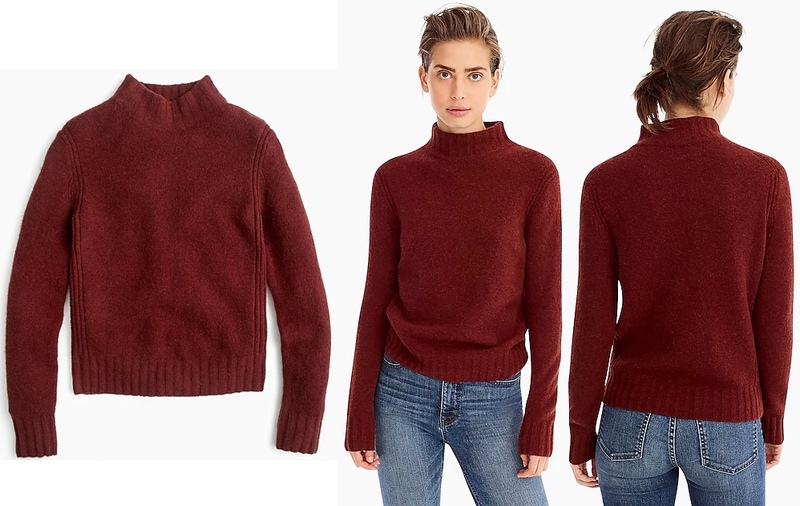 Middleton Maven suggests it is the Mockneck Sweater in Supersoft Yarns in ‘mahogany’ ($79.50 ), it is by a retailer we know the Duchess has worn before, J Crew. The sweater is made of a nylon/merino wool/alpaca/elastane blend, and available in a rainbow of colors. The Duchess had on Zara trousers, although we aren’t sure if they are new, or a previously worn pair. Emma4AboutRoyal tweeted they could be the pair worn in Canada during the 2016 tour. Kate wore a new pair of boots from See by Chloé in dark suede with leather trim. The style features an oversized back pull loop, reinforced eyelets, treaded rubber sole and a distinctive stacked 1.5″ heel. They are available in just two sizes at Net-a-Porter ($267, 40% off), but the product page shows several sizes as “coming soon,” so it is worth checking. There are also very limited sizes available at Luisa Via Roma (on sale for $311). Many recognized the earrings immediately; they are the Lauren Pavé Leaf style by Kiki McDonough. We will see you tomorrow for Kate’s visit to the costume department at the Royal Opera House in Covent Garden! Here is 3:40 of natural sound from the Royal Family Channel. And this is 27 minutes+ from 5 News. If her hairdresser (not you Susan; you already work harder than anyone else!) posted a video tutorial on how to create that perfect ponytail in the history of the world, life would be complete! On topic: I would love to see Kate wear more earth tones, even during more formal engagements, especially given how stunning the shades of the sweater and coat are on her! I know why she wears brighter shades in public, but earth tones are her friends! The J.Crew sweater in that color is one of the most gorgeous things I have ever seen her wear, period. I am not loving the skinny jeans look either. I am a couple of years older than Kate, and while I do wear skinny jeans, it’s all about finding the best fit, fabrics (no more than 2% of the jeans should be Lycra) and the brand in order for them to be flattering. That said, I do wonder how skinny jeans would look if Kate opted for a different brand or style? Perhaps even buying one size larger than normal and having them tailored would make a huge difference. I don’t presume to speak for anyone else, but they look so tight and out of proportion against her sweater and coat, hence the jarring (to some of us) appearance of her skinny jeans during visits like this one. Eileen, I think you’ve put your finger on the problem with Kate’s jeans. If they’d look less painted on – as most women’s skinny jeans do – I think there’d be many fewer negative comments about them. Maybe Kate should try a different brand or size, as you suggest. I agree re: the Rochas dress. One of the most overlooked and underrated pieces she’s ever worn. It’s such a splendid color for her; and portrays such an effortless style. I want to see her wear it again. I love this outfit. It is something that I would wear if I was to go outdoors, especially hiking! I always wonder what pant people would suggest she wear with a boot if not skinny jeans. This is why skinny jeans were made – for boots. Any other style won’t go into a boot without unsightly bunching in the leg. The only other style which suits a boot is breeches and no one is riding here, so breeches aren’t going to work. The outdoors mean tucking your pants into your boots to prevent pesky bugs from getting onto your skin! Skinny jeans, wonderful things! That children’s book looks delightful! I might have to get it for my nephew! Kate was certainly in her element at this engagement! I love seeing her interact with children. She’s so natural and involved when speaking with them. Amazing. I am a member of the skinny jeans non-fan club and particularly here. Especially in the films of Kate’s arrival, I found that her jeans looked like leggings and moreover, the very skinny leg made her boots look large and clunky. But maybe that’s how they’re supposed to look. My hiking boots look like that on me, but I never found the sight particularly beautiful. What is beautiful, though, is Kate’s smile, her laugh, her complete devotion to whatever she’s engaged in. I love this look, but i wanted to comment on my favorite – the little boy “Patrick” with the glasses that asked to see Kate’s kids. So freaking adorable and, as an American, one of my most favorite things is an English accent on small kids. It’s just the cutest thing! I love this english country casual sort of style on Kate, the coloring and all just really works on her and she seems totally at ease and really thrives in this setting. As someone who loves to garden and connect with nature, I was looking forward to this post! And Im excited to see Kate’s garden with RHS. The DoC does this upscale country outdoorsy vibe so well. I absolutely covet both the jacket and the boots. No problem on my end with the skinny jeans, though they’re clearly not the stars of this outfit. Love the color of the sweater, and I never fail to be amazed at how the Duchess can seemingly pull off every color in the color wheel. Thank you for yet another glimpse of that wonderful green-and-white silk dress from the 2017 flower show. I live in hope that we will see it again! I really like this casual outfit on the Duchess. I am always a fan of mossy tweeds and the chunky Chloe boots are stylish at a time where many young women are (again) wearing Dr. Martens. I have not read all the comments yet, to ensure my own opinion is not unduly affected, but I wonder if there will be any discussion of the “skinniness” of her pants. My thought is that Kate is extraordinarily fit and any pair of jeans/cords/khakis will look snug on her upon first glance because she is, frankly, teeny tiny. I like this pant choice and think her gorgeous blowout and earthy makeup tones are very well done. I really, really like this look. I give the whole thing a firm thumbs up! Gorgeous jacket! The whole outfit is fun! Love, love the boots. I had a smile when I look at Kate’s outfit she was wearing and what the Queen was wearing back in my childhood. My grandmother would never have seen the Queen wearing what Kate wears today and I believe the Queen would have loved to be more ‘hands’ on the way Kate is on her visits, especially with the children. What a stunning look. Catherine always looks amazing in casual outfits. I absolutely love it when she wears skinny jeans as they make her look young and fit – which she is. I cannot understand why people pick on her for wearing skinny jeans as a future Queen. Firstly, skinny jeans and pants do look great on a great number of people, as long as they are skinny and fit, which Catherine is. Secondly, slim/skinny pants are a classic. And thirdly, I think you have to be incredibly conservative to believe that just because someone is to be a future queen or is a queen, she cannot wear more body-conscious clothes. I should hope that the monarchy can keep up with the times, while still remaining relevant, without having to drape people into mom-fit jeans. I keep reading these either-or suggestions: if she doesn’t wear skinny jeans, she has to wear mom-fit jeans OR if she doesn’t wear skinny jeans, she has to wear wide-leg pants. There are pants other than skinny, mom, and wide-leg. What a fantastic outing! Loved the precocious questions from the children and Catherine’s responses. Really looking forward to the Chelsea Flower Show this year. Catherine looks fabulous. Love the entire outfit and nice to see the jacket is a piece she wears regularly (spotted in it in Norfolk shopping with George and Charlotte day before Christmas). The boots give the outfit a bit of an edgier look which I like. Hair and make-up perfect, skin glowing. I wonder if there is a demographic divide on the thoughts about skinny jeans. I’m 26 and have worn almost exclusively skinny-cut jeans since reaching adulthood. I don’t even know what else Kate could wear with a pair of hiking boots without throwing on a pair of all-weather trousers, which frankly would be unnecessary for an event like this. She looks great in skinny jeans! I bought a pair of the Zara mid-rise skinny jeans before Kate was seen wearing them (fall 2016) and they are some of the most comfortable jeans I own while looking good with everything. I wanted to pick up more pairs but sadly the collection from spring 2018 somehow shrunk two sizes. So excited about Kate’s work for the Chelsea Flower Show! That sounds like a project right in her wheelhouse and I can’t wait to see what the team comes up with. I am 47 and I approve of skinny jeans (and wear them myself, even though I am personally *not* skinny)! But then, I have teenage daughters, so I’m very accustomed to this look, to the point where, like you, it just seems normal to me. I am 62 & love the skinny jeans. I also wear skinny jeans. They are so comfortable. Thanks so much for the detailed post! We’re so lucky to get the background info AND the clothing in one spot! Love the shoes, so great to see her mixing it up a bit with a trendier style. Those earrings are my least favorite Kate item of clothing and mixing them with the boots is certainly unexpected. Her smile and hair are so beautiful and glamorous today even though she’s “only” out in a community garden! I adore Kate’s jacket. It is the picture of what a British, country lady of means would have in her wardrobe. It is timeless and could be worn for decades. I imagine it is a favourite clothing item when at Amner Hall, in Norfolk. The pop of colour from the sweater is a nice contrast. As others have said the skinny jeans need to go. They look tight enough to be leggings. Yes, Kate has great legs, but even on casual days, a future queen, on an official engagement, needs a more polished look. Liora mentions slim corduroy pants looking nice and I fully agree. 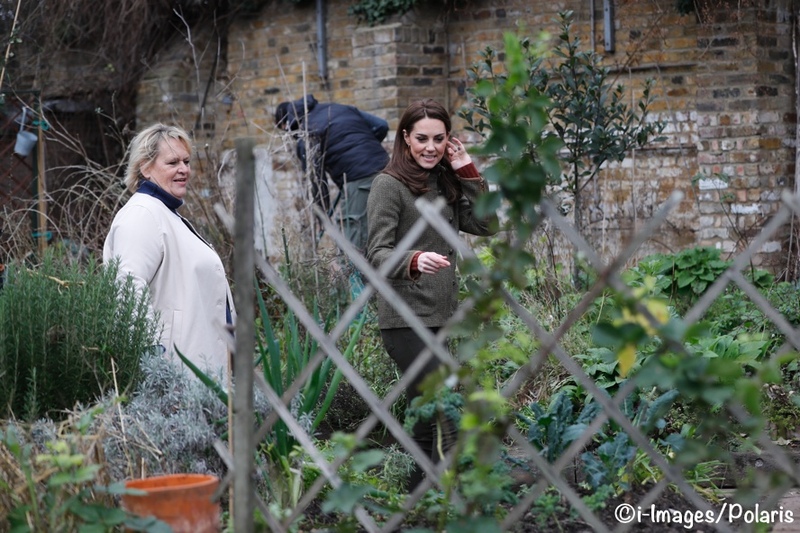 Now we have the anticipation of seeing Kate’s input into a garden design. Something nice to look forward to. Loved everything about this visit – her outfit, her hair, her easy chatting with the kids, the amazing outdoor garden. I could just as easily list those in reverse order, but this is a clothes site 🙂 I was prompted to pop on and say that while the boots she was wearing today are not my favorite, all three of my college aged/young adult daughters have similar boots. It’s a trend with someone, so it’s not surprising to me that the DoC would have a pair. This is so Kate and a wonderful outfit for a day outdoors with small children. It’s so British that if she had worn her wellies with it, it would have been cliche! The combat/hikers add a bit of edge; I think they look adorable on her. I am one that often wishes she would ditch the skin tight pants but here . . . I like ’em, and she absolutely has the right figure for them. And, I think that she is one of the few people on the planet that can wear a bulky sweater under a wool tweed jacket like this one and still manage a slim silhouette. GO KATE! I see no reason to stop wearing a style that one loves and is comfortable in, as long as it is still flattering. Very informative post Admin! I am eager to see the Duchess’ garden designs and thanks so much for including the information on the Macfarlane book. I am going to check on it right now! Clothes, words and birds . . . three of my favorite things! @admin: Thank you for all the information and detail in this post. 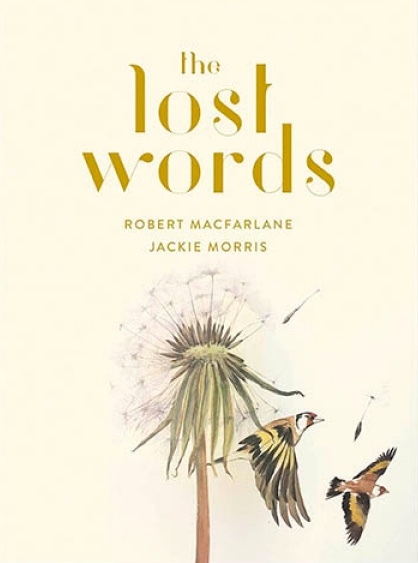 ‘The Lost Words’ sounds like a book every child should read. How sad that so many words associated with nature are falling out of usage in today’s world. The thought of children not even knowing what a dandelion or acorn is breaks my heart. This was a great engagement. What a wonderful resource the garden is for the children and local community as a whole. 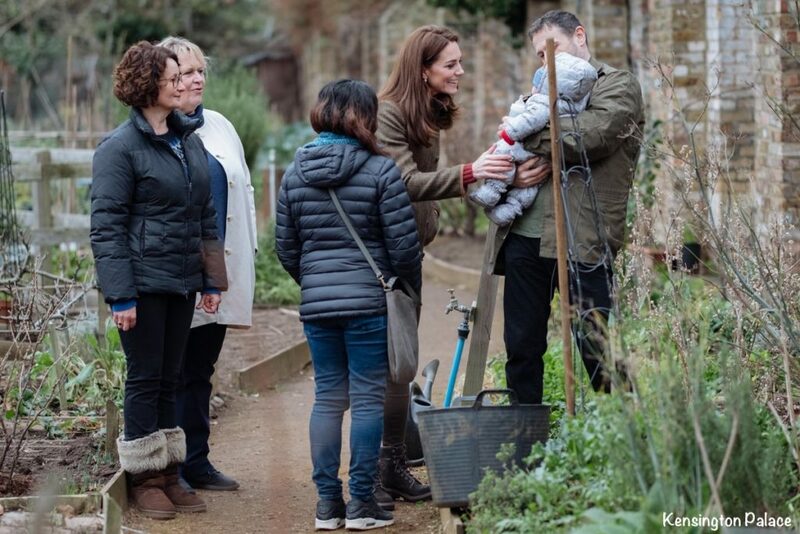 Kate is an absolute natural with children. As someone who can sometimes find it a bit awkward with other people’s kids I think that is a very enviable skill to have. i also thought it was such a sweet gesture that Catherine received presents too. Wonderful news about the garden design for the Chelsea Flower Show. I particularly love reading all the background information about Catherine’s involvement from the landscapers she is working with. Just shows there is so much going on behind the scenes we don’t know about. I thought it was wonderful to hear all three had read ‘Last Child in the Woods’. I wonder if Catherine read this pre-Royal life because one of her platforms from the start has been the importance of children experiencing nature and the outdoors. One of the key points in the book is about green urbanism where city have areas of nature and wildlife for children and the community to experience and Kate has been supporting places like this with the visit today or Sayers Croft last year or the school garden and when she used to volunteer with the Scouts. Loved her outfit today. Comfortable, stylish, appropriate including the (maligned by some) jeans. I thought the colours were a little dull so the addition of the red jumper for colour was a great choice but I can confirm it was so cold in North London yesterday I completely understand why she didn’t take her coat off. I love those boots so much. As always I continue to be impressed with how seamlessly she mixes high street and higher end items. Her hair looked luscious today too. I’m really happy she is growing it out longer again. Always look forward to a Kate appearance. She has such a great rapport with the children. I cannot wait to see the Chelsea garden design. Loved the jacket, hair is perfection. Not happy with seeing the revealing skinny jeans again. It is time to wear more elegant pants befitting a Duchess who will be Queen one day ( or anyone in the public eye ). I think she looked absolutely lovely! I get so puzzled by the criticism of the skinny jeans. Goodness, she is 37 years old. Every young woman I see is wearing these pants, they never wear wider pants. Even I wear narrow pants, not quite so skinny, and I am very much older. Lots of time to wear wider pants. But I must say she was glowing. You can tell she loves children. On another note, I never cease to be amazed how warm it is in London. I live in Canada and it is freezing! Looking forward to seeing her tomorrow. Always a pleasure! From the outfit to the interactions, everything was just charming. She’s so genuine. The jacket was perfect for Catherine and for the event. Thanks for posting the long video, Susan, and I am sorry you’re feeling under the weather. Hope you’re feeling better soon. I want to see all these pieces reworn again because they are great individually. I’m just struggling with them ensembled. I love the top half, and I like the bottom half. I just don’t really like them together. That sweater and jacket combo is money, with the jacket a slight step up in the formality department than some of her more outdoorsy coats. I’m sure the skinny jeans are well-kept, but they just look faded or washed out to me in this color, especially today. Those new boots are “tromping” gear, for sure, and also stylishly on trend – a smart blend of fashion and practicality. But I have a hard time seeing them as cohesive with a jacket that so clearly cries for riding boots. 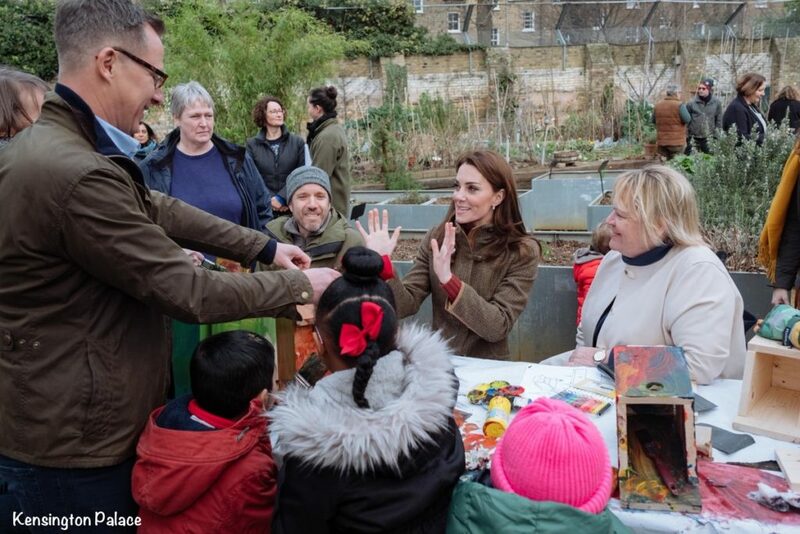 As always, it’s a delight to see these casual events, which seem to be at the emotional center of Kate’s wheelhouse, and how she connects so well with the people at them. However, as usual, really really wish she’d leave the super-tight skinny jeans home for an official engagement. Yes she’s remarkably skinny for a mom of 3 but it always looks inappropriate for a Royal visit. I think I’m in the minority here but I love Kate in skinny jeans/trousers. I think she looks so amazing in them and I’m so envious of her gorgeous figure. Loved everything about this ensemble. Especially those boots! Susan, thank so much for always providing such fantastic details and photos. I know this blog is a lot of work and it is appreciated so very much. Feel better soon! I’m never really sure how her hair is styled! Is it blown out and curled w hot rollers? It has so much volume at the roots to be long. It’s beautiful and I finally no longer miss her past extra long length. She gets casual consistently right! Kate looks great from the ankles up! The boots are a little combat-y to me, although I do like the earthy brown leather– it blends well with the rest of the outfit. The styling, tweed and fit of this jacket are fantastic, and the pop of red from the sweater is fun. The earrings are subtle and Kate’s hair is beautiful. 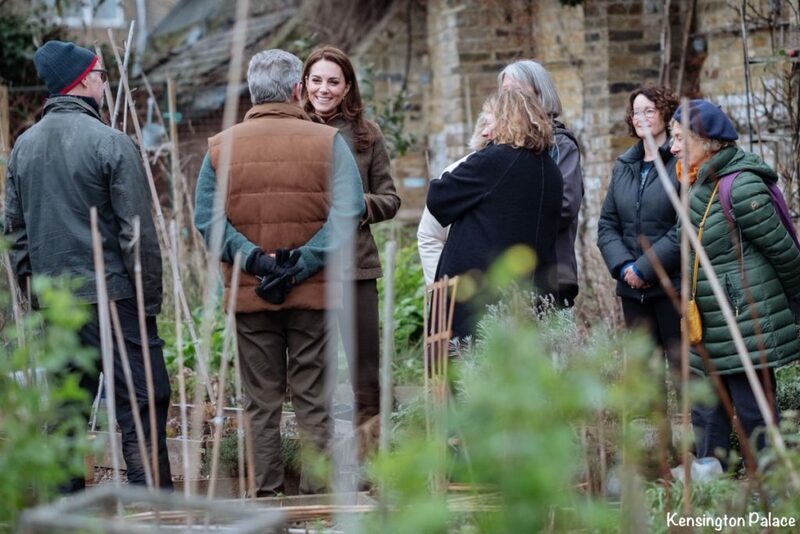 It’s wonderful to see Kate so frequently championing causes that connect kids to the outdoors, and it will be a treat to see Kate’s garden designs as well! If there is a heaven for hair, Kate’s should be in it. She looks amazing, and the best part is that she also looks like a truly nice person. Great comment. She does look amazing and I love her whole outfit especially the jacket. The way she engages with the children is just priceless. She is fully engaged in what they are saying and gives them her full attention. They know who she is and she just puts them at ease so they have no trouble asking her questions and participating together in the activity. Love it! Nobody does olive drab better than KM. I love the Irish tweed jacket with the reddish brown sweater. KM is very slim, so she probably needs to figure out how to deal with the wrinkles in her leggings. I hate so say it, but I think the wrinkly britches detract from her overall look. Also adore the earrings, I bought them for my daughter one or two Christmases ago after reading about them on this blog. (I bought the heart drops, as she already had the hoops which she can wear with different McDonough drops). They are sparkly, yet delicate and understated, perfect for the casual tweed look. KM’s long legs make the combat boots work, but I don’t think I would like them on a shorter, wider leg with leggings and a jacket. All in all, a very successful ensemble for mucking around in the garden with kids I would say! The skinny jeans/pants were ok for a garden outing, but I think Kate wears them too often. At what age are they inappropriate for the future queen? I don’t think there is an age they would be inappropriate in a casual outdoor setting like this. I love her casual looks. Never! There’s nothing wrong with them at all. Even queens go casual from time to time, including ERII. Love the skinny jeans, they look sensational and it is totally irrelevant what age you wear certain clothes as long as you are comfortable and feel good in them. What does being the future queen have to do with age??? In my opinion, at absolutely no age PeggySue. Call me crazy but I wouldn’t mind seeing Camilla in them, if it was her style and made her comfortable. For Kate the skinny jeans are a trademark outerwear and honestly I cannot think of an outfit more appropriate and practical for this specific engagement. IMO there is no age at which they are inappropriate for a future queen. I am several years older and not nearly as slim as the duchess and I wear skinny jeans almost daily. I have friends ten years older than myself who wear them regularly. I really don’t get the dislike of the look. It is exactly what I would wear if I were visiting this garden and mucking about outside with children. As for the “too often” part of your comment, I am puzzled as it seems to me she only wears them for outdoorsy or casual engagements–it is not like she wearing them to the royal opera house. I concur with you. If you have thin toned legs, why not wear skinny jeans regardless of your age. The Duchess of Cambridge looks stunning in her casual clothing. I only wish I looked as thin and trim as she does! I totally agree. It doesnt matter whether Kate is Queen, Duchess or commoner, skinny jeans are spot on for this type of event. Not appropriate for the opera of even the Chelsea flower show but Kate is more than able to ascertain events for when they are suitable. One of the things I like most about Kate’s style is she is always appropriately dressed. She looks good in skinny jeans and I hope continues to wear them at any age as do many other stylish famous and ordinary women. 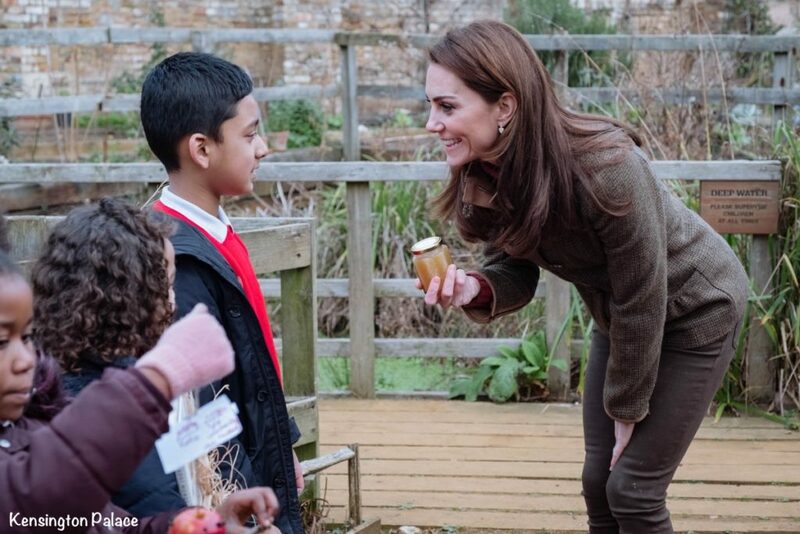 Well, naturally I love the clothes, but what’s really blowing me away here is Kate’s ability to converse with the kids! I have several nieces and nephews who I love to play with, but if they don’t carry the conversation then I’m at a loss. What a great job she does with young children who just met her and would be a little shy. Thanks, as always, for a great post. 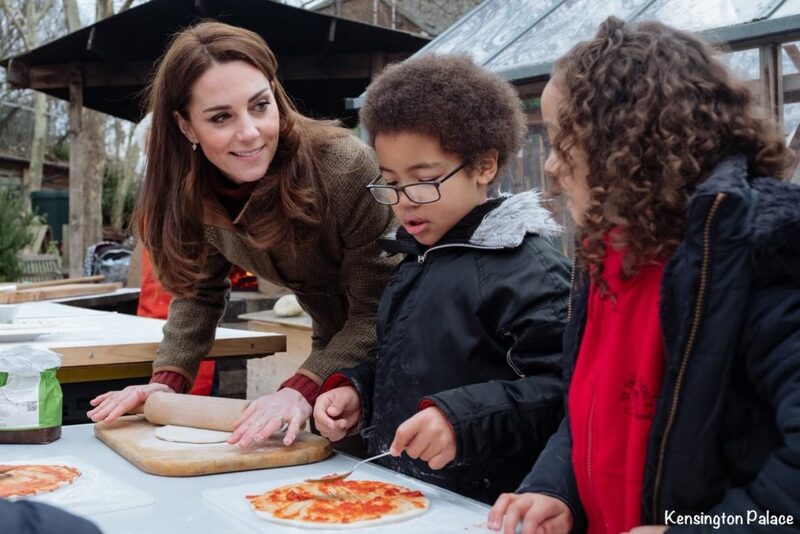 As a retired teacher, I can say that Kate has a wonderful skill set for engaging with young children. She has a knack for involving them in conversation, which in turn enhances their confidence and self esteem. I am certain that she is an amazing mother and she would make a very effective teacher. Love love love the tweed jacket. The fabric, the style, and the details are so well done. It is timeless and will last a lifetime! Not a fan of the skin tight pants and the boots are a bit too combat-ish for me, but overall I think she looks super. And Kate’s hair looks AM-A-ZING. I haven’t been a fan of the reddish tint lately but it works with the hues in this outfit and it also looks like she might have had a fresh trim since we saw her last outside church. As has been noted so many times before, she is really in her element in these types of engagements. I can’t wait to see the garden she is co-designing! I love this jacket’s fit and the color scheme- muted green, brown and warm red look great for an outdoor event, and are so flattering on Kate. Thank you for the plethora of lovely pictures! I’m a Brit, living in the USA and get homesick from time to time, so I really love this site! I think Kate’s tweed jacket is gorgeous and I really like the ‘English country’ look, but I really dislike those skinny jeans. I’m hoping that the skinny jeans trend dies out soon as they flatter nobody. I’d love to see Kate wear a nice pair of slim/straight leg pants. Some slim corduroy pants would’ve looked nice today. However, the overall look today was really good and I like how she always looks happy and animated doing this kind of outdoorsy engagement. I don’t look great in skinny jeans so I’m hoping the trend dies out due to that. Lol. However, I think Kate looks fantastic in them. I love the tweed jacket as well. 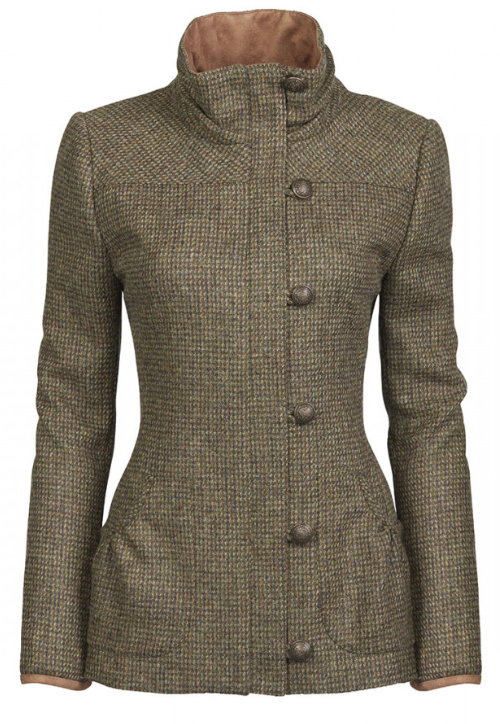 The wool tweed Dubarry jacket with leather trim is lovely and certainly a signature item many women would love to have in their closet! I think I’d like a thinner gauge wool sweater though, underneath, as the J Crew turtleneck Kate is wearing makes the jacket appear bulky. We’ve seen variations of this look before on Kate…the black skinny jeans with the Smythe Blazer to Coach Core and the Zara Biker Jeans ensemble to Forest School in Paddington in October. Today’s version with the clunky Chloe ankle boots just seems more suited for hikes at Balmoral or engaging wildlife at Sandringham – not so appropriate for a professional royal visit to a community park – in my opinion. She was with kids eating pizza and making bird houses. It would have been weird had she worn heels or a formal shoe in my opinion. Amelie, I doubt that Christina was suggesting heels for this outdoor event…just a boot that is less clunky and a bit more feminine. I could be wrong, but I didn’t take Christina’s comment as advocacy for a formal heel. I read it as Christina expressing a preference for a ‘dressier’ style boot. Thanks for each of your replies! To expand on my original comment… I felt the Chloe boots were better suited for more extreme outdoor activities like those I mentioned. They seemed a bit over kill for the community garden’s art and food activities with the children. What would I suggest in their place? Something like Dubarry’s short Cork Ladies Boot. I just love that Kate has managed to rework her whole outdoor look, changing up from Penelope Chilvers and Really Wild to this classic Dubarry with Chloe boots. The jacket looks tremendous on her, the colour so flattering, even though it reminds me of some fairly stuffy country-wear catalogue style. On Kate’s fabulous figure there is no question of it looking middle-aged. I think the boots are fabulous, and a departure for Kate as I don’t recall her tackling this combat-style in an ankle boot before. She usually tends towards the feminine. In fact, the style reminds of the boots in which we used to see Meghan trudge the winter Toronto streets, tempting to wonder if the two Duchesses might have been comparing style notes. We’re back to the skinny jeans though I’m over worrying about them. I like that her jacket and jumper seem to cover enough of her modesty to keep her respectable, and that style of boot really needs a slim leg pant. 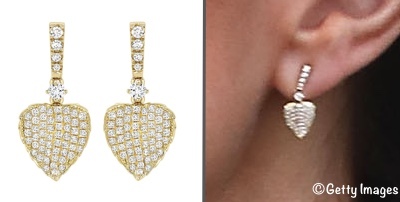 Very happy to see the diamond leaf earrings – very appropriate! I had expected some version of this outfit once I heard the nature of the engagement. The only thing that surprised me were the boots—I expected the Really Wild ones like she wore on her first engagment after returning from maternity leave for Louis, or perpaps her green wellies. I was surprised by this footware choice. I don’t “not like” them, but I don’t love them. All in all though this was the perfect sort of outfit for this outdoorsy engagment. I love that jacket and it is so flattering, and the pop of color from the sweater was just lovely. In fact, I would wear every piece of this outfit, with riding boots. Her hair and eye makeup were on point today and the tiny leaf earrings were the perfect choice. She always seems to shine when outdoors with children. I’m always a fan of outdoorsy Kate, so this look hit it home for me. I like the colour palette, especially with the specs of red to be seen at collar and cuffs, and I’m a great fan of the sturdy boots. Everything looks perfect for an outing in a gardening context. My only minor quibble is with the earrings, I’ve never benn a fan of the golden hearts (too girly for my taste) and I would habe prefered a pair of simple studs with this outfit. I’m surprised an event like this was planned for January (with the outdoor-cooking and everything), since I would have guessed that the weather could be an issue. It was obviously okay (I noticed some people were wearing their jackets open and none of the kids appeared to need gloves) but if I had seen Kates outfit for itself I would’ve guessed “engagement in early spring or late autumn”, not “in the middle of winter”. Looking forward to tomorrows engagement! loved the outfit too. The fact that they are gardening and things around them were still green tells me it’s not actually cold there and hasn’t dropped below freezing or everything would have been killed off and they wouldn’t be planting things. Until reading this I had always assumed gardening in Britain took at least a couple of months off in “winter” but I was wrong. It seems it’s never actually cold enough to stop if you don’t mind throwing on a light jacket. I have a deep love of olive green, so of course I think this outdoorsy look is beyond lovely. That muted pop of color in the turtleneck was just perfect! Fascinating to read all the details you included in this post, Susan. Makes it well worth the wait to have such a well-researched and information rich blog. I’m here for the clothes of course, but I am cheering Kate on for these wonderful projects and initiatives. Thank you, LadyLeah, that made my day. I’m a little under the weather and feeling like the slowest writer on the planet! Just wanted to add my thanks also, Susan. Your blog is always brilliant, and I’m sure most of us really appreciate the information you provide to set Kate’s clothes in the context of her work and her personality. Your approach has truly brought her style to life. Looking forward to plenty more in 2019! I agree with LadyLeah too. All the extra details that you included in your post all the time. I always wait for your well-researched information on all aspects of the event, it is well worth the wait! Thank you. 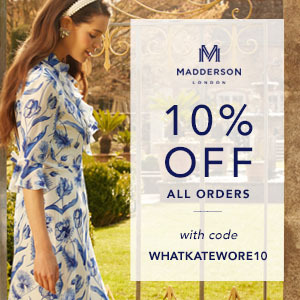 I read this post for the clothes, shoes, handbags etc., but I am very interested in the history, etc. Always very well done. Feel better, hang in there! Hope you feel better soon, Susan. The winter blahs impact in many ways. May you have sushine tomorrow, literally and figuratively.